Earth's climate has a complex relationship with life in the oceans. Marine creatures provide us with oxygen, affect the carbon balance in the water and in the air, and are in turn affected by temperature and climate change. Now, it appears that even viruses can influence cloud formation and rainfall. Phytoplankton is a general name for all bacteria and unicellular algae that live in the water and are capable of photosynthesis, i.e., produce energy in the form of sugars from water and carbon dioxide. Some can form ocean blooms, which are clusters of a vast number of cells in the water. One such algae species is Emiliania huxleyi, from the coccolithophore family. The algae of this family have an exoskeleton comprised of calcium carbonate (CaCO3), similar to limestone. The exoskeleton is composed of many plates, called coccoliths, which are formed inside the algae cell and then secreted. Numerous coccoliths link together to form the spectacular exoskeleton. These algae form enormous blooms in the oceans, which can extend hundreds of square kilometers in size. 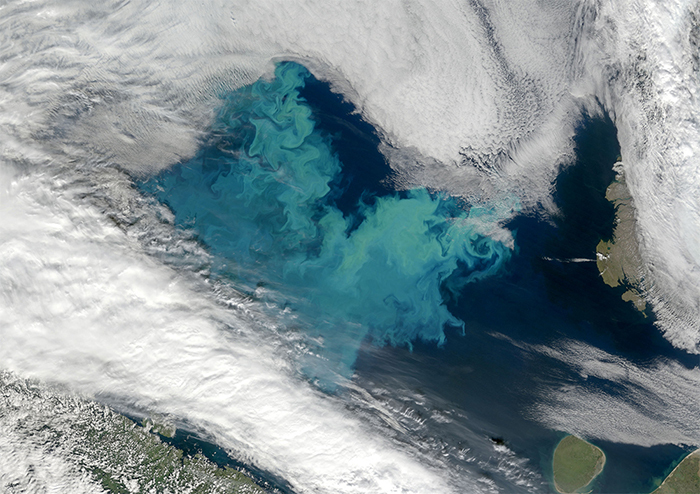 Satellite images show the green chlorophyll of the algae and the coccoliths’ reflection, which render the water a white opaque tone. These blooms are eventually destroyed by viruses that infect and kill the algae cells. 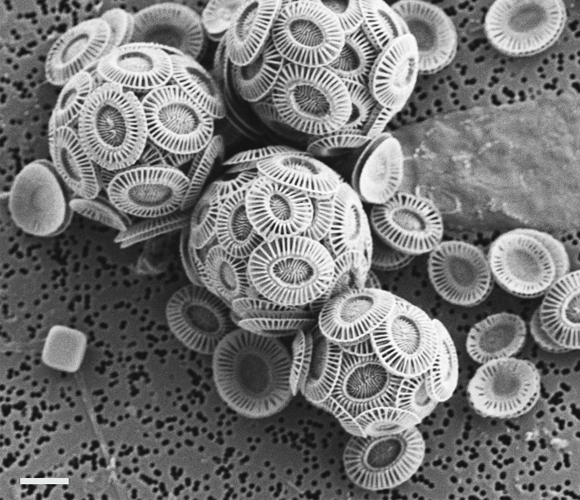 The dying algae cells shed their coccoliths and sink to the ocean floor. Over the course of millions of years, the coccoliths form beautiful, large limestone rocks. A recent study, led by Dr. Miri Trainic, as part of a collaboration between Profs. Assaf Vardi and Ilan Koren's laboratories at the Weizmann Institute of Science, found that coccoliths sometimes face a different fate: They are expelled from the water into the air. The researchers used a sophisticated system for inserting air bubbles into virus-infected algae in the lab. The bubbling imitated natural processes that occur in the ocean, during which waves cause water to mix with the air. The air from the system was collected and analyzed. This led the researchers to discover that virus-infected algae emit 10 times more coccoliths into the air compared to healthy algae. The coccoliths are discharged into the air intact, in a process called aerosolization. During this process, coccoliths become solid particles that linger in the air (aerosols), according to their mass and density. The coccoliths’ characteristic shape, containing air holes, gives them a low density relative to their volume, that is, they have a low specific gravity, which enables them to linger in the air for a relatively long period of time. This phenomenon may have a substantial effect on the atmosphere. The calcium carbonate that comprises the coccoliths affects chemical reactions that take place in the atmosphere, such as interactions with ozone. In addition, coccoliths can serve as condensation nuclei required for cloud formation. Therefore, the emission of coccoliths from the sea into the atmosphere from virus-infected algae can affect atmospheric processes and even climate. The study demonstrates the intimate relationship between the sea and the atmosphere, and how dynamic biological processes in the water can affect climatic processes. Another study by the same research groups showed that the viruses themselves are also emitted to the air, where they still maintain their infectious abilities. This has immense ecological importance, since airborne viruses can travel very large distances and reach regions that have not been infected yet, and where they may have a profound impact on algal bloom dynamics. Both studies show that the relationship between the sea and the atmosphere is bidirectional. Namely, not only does water biology affect the atmosphere, but the atmosphere also has an effect on biological processes taking place in the water. It is highly likely that there are other biological processes that bear on the atmosphere and climate on Earth. Studying model systems of organisms with ecological importance, such as Emiliania huxleyi, expands our understanding of biological processes. The knowledge accumulating in the lab can be useful for researchers conducting studies in natural settings. Both of these factors shed light of the ecology of organisms and its profound impact on the planet.